Featuring a number of strong female leaders, this thrilling sci-fi epic paints a vivid and vital picture of a fascinating planet on the verge of social revolution. The planet Darracia is on the verge of a social revolution, antiquated customs and repression slowly making way for a more liberated ideology, when unexpected opposition shatters the beloved royal family and throws the entire populace into chaos. 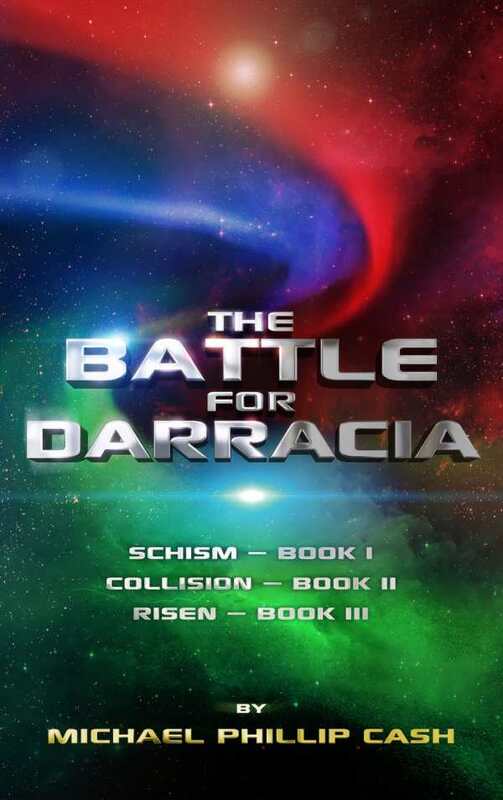 The Battle for Darracia, a compilation of books one through three in The Darracia Saga from Michael Phillip Cash, chronicles the rise, fall, and redemption of a species fighting for the right to exist in a harsh world, on a planet where beauty and cruelty exist side by side. Prince V’sair longs to prove himself a worthy successor and able leader of the warlike Darracians, but his mother’s Plantan heritage dominates V’sair’s slighter, fairer form, and he has yet to test his strength and heart against the legendary Fireblade, a deadly weapon of lore wielded by only the mightiest Darracian fighters. Forced into action by the evil machinations of his power-hungry uncle, Staf Nuen, V’sair, along with his half brother Zayden and the wildly alluring Quyroo priestess, Tulani, travel from the heart of the land to the far reaches of the sea and beyond to unite the power of the elements and unlock the secrets of the Fireblade to bring peace and prosperity back to the land, the waters, and the floating cities high in the air. A narrative in three complete parts, The Battle for Darracia encompasses Schism (Book I), Collision (Book II), and Risen (Book III) of The Darracia Saga, and while each has merit as a standalone, together there is seamless continuity that functions as a single tale as well, absent any repetition or recounting often found in sequels. The action is ongoing and intense, with each book shifting slightly in focus and tone as tensions mount, allegiances shift, and alliances form. One constant throughout is the presence of a bold cast of characters, including a fair number of strong female leaders like Bobbien, a crafty healer ruling the deadly forest floors with Yoda-like strength and speech; Queen Reminda with her gills and dreams of social reform; and Denita, a hardened survivor making the most of a desperate situation. Colorful in every sense of the word (blue, gray, brown, red, and larger than life) the “people” of Darracia love passionately and fiercely, and the concepts of racism and inequality are easily recognizable themes. As Denita remarks to Zayden, “We are all broken in one way or another,” and the resilience, hope, and human qualities revealed add layers and depth to the players in this otherwise action-driven trilogy. Fanboys and fangirls looking for something new while waiting for the next installment of Star Wars or Avatar will revel in the interplanetary drama, combat, romance, and magic that permeate The Battle for Darracia. Cash paints a vivid and vital picture of a fascinating planet and its even more fascinating inhabitants, a thrilling addition to the world of science fiction.